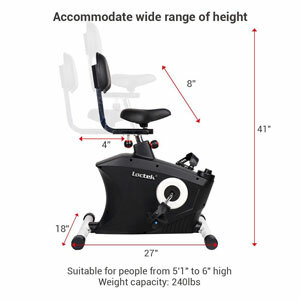 The Locktek U2 is an under desk exercise bike, with a seat disposition and construction between an upright and a recumbent bike. 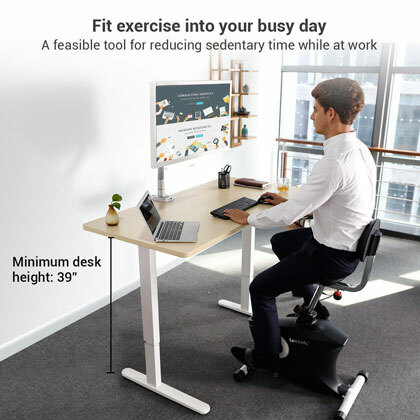 It’s a model designed to help you maintain your leg muscle tone during your working hours, as well as higher heart rate during working hours, aspects that can considerably benefit your health. It’s a fitness machine perfect for anyone with a desk job. The frame of the Loctek U2 is made of steel tubing, solid enough to support users up to 240 lbs (108 kg). Its maximum weight capacity is actually a bit higher than the average office seat. Since it’s not a bike designed for intense workouts, and does not have a handlebar, it takes very little space. Its footprint is a bit larger than the one of an office seat; fully assembled, the bike takes only 27″L x 18″W (68.5 x 46 cm) of floor space. Although its frame is made of steel, this bike is far from being heavy. It weighs approx. 46 lbs (20.8 kg), and anyone should be able to transport it or relocate it if necessary. The bases of the frame have highly durable PVC caps at their ends, caps that also act as stabilizers. This bike actually offers excellent stability, even if its not placed on a rubberized mat or carpet. Evidently, this exercise bike is meant for indoor use. Even though its frame is coated with corrosion resistant paint, if used or stored outside, moisture can still damage the internal parts. The paint finish on the frame tubing is white in color. However, the seat bars and the cranks have a chrome finish. The first aspect to mention here regards the bike’s adjustability. The seat is 4-way adjustable: up, down, back and forth. It’s upright adjustment span is 8″ (20.3 cm), while its horizontal bar allows 4″ (10.1 cm) of adjustment. At its lowest position, the seat is placed at approx. 30″ (76 cm) above floor level, while at its tallest setting, it stands at 38″ (96.5 cm). In other words, the bike can accommodate users between 5’1″ and 6’0″ (155 – 183 cm). Also, it’s meant to be operated at a desk with its top higher than 39″ (99 cm). The seat itself, although not as comfortable as an office seat, it still offers excellent comfort compared to a bike saddle. It’s 8″ (20.3 cm) wide, and integrates a consistent layer of padding. However, its comfort can always be increased by applying a gel cover on top of it, or a sheepskin cover. The backrest is attached to the same tube as the seat. It cannot be independently adjusted from the seat. It’s designed to provide optimal lumbar support, also integrating a thick layer of padding. In case you’re wondering, with the seat at its lowest position, the top of the backrest is situated at approx. 41″ (104 cm) above floor level, while with the seat fully extended, the backrest height reaches 49″ (124.4 cm). The seat is easy to adjust. Both its upright and horizontal bars have large knobs, easy to turn and pull. Thus, adjusting it to your own requirements shouldn’t take more than a few seconds. The Loctek U2 is equipped with a belt drive system, using a heavy-duty v-belt. The pedaling motion is almost silent. This being said, you can definitely use the bike in an office with multiple co-workers without bothering them. The bike’s flywheel is made of steel. It’s not an extremely heavy part. Its standard weight is not specified; it weighs approx 8 lbs (3.6 kg), having most of the weight located in its perimeter. Thus, it delivers a steady motion, and a consistent momentum. The bike is equipped with a durable, 3-piece crankset. However, even though its crank arms are made of solid steel, it’s not meant for standing up pedaling routines. This bike is meant for seated pedaling only. The crank arms are finished with heavy-duty nylon pedals, with adjustable straps. Each strap has 6 adjustment settings, being able to accommodate shoes of all sizes. The pedals have a weighted design, each one of them should assume its standard position once you remove your foot from it. And finally, the pedals have standard threads, thus you should easily find replacements for them in case its necessary. In case you’re wondering, pedaling in reverse is possible, but in this case the resistance will drop a bit. 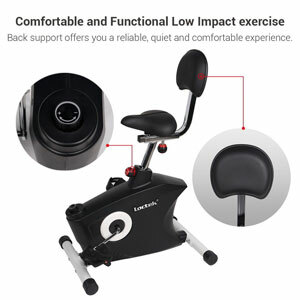 In terms of resistance, this exercise bike is equipped with a manual magnetic system. The resistance system consists of a magnetic element connected to the tension knob at the front of the machine. By turning the knob, the magnetic element will shift its pull onto the bike’s metallic flywheel, adjusting the overall resistance. The bike makes available 8 distinctive levels of resistance. The first resistance levels supply a very light workout, while the top 7-8 settings deliver a resistance level which can be labelled as medium. In other words, by pedaling on the top resistance levels, you will definitely feel the burn in your leg muscles, and put your heart to work. The mechanism of the bike comes ready-assembled. Therefore, in terms of assembly, you only need to attach the base bars, the seat, its backrest and the pedals. This shouldn’t take more than 15 min. The supplied manual provides clear step-by-step assembly instructions. Also, all the tools required for assembly are included. Maintenance doesn’t require the lubrication of the internal parts; they come pre-lubricated from the factory, with industrial quality lubricants. Thus, all you have to do for maintenance is remove the dust from the machine, periodically check its bolts and nuts, and re-tighten them if it’s necessary. 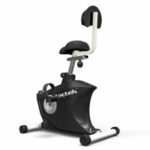 The Loctek U2 is an under desk exercise bike, perfect for anyone with a sedentary job. It offers 8 levels of quiet, frictionless and smooth magnetic resistance, perfect for maintaining your muscle tone and boosting your heart rate during work hours, aspects that can definitely improve your level of fitness and overall health. Although it’s not a fitness machine for intense training, it can still deliver pedaling workouts of medium intensity. Its seat provides optimal comfort and excellent lumbar support. In all, it’s a fitness machine with a solid build, great stability, with an excellent price / value ratio.